WASHINGTON (Nov. 11, 2018) – In remembrance of generations of veterans who have served America, Wounded Warrior Project® (WWP) participated in several ceremonies around the nation this week. 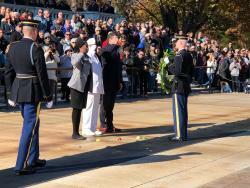 At Arlington National Cemetery, WWP Legislative Affairs Director Brian Dempsey and WWP teammate and Air Force Veteran Tanisha Brown participated in a wreath-laying ceremony at the Tomb of the Unknown Soldier. At the Veterans Day National Committee reception, Bardorf also addressed distinguished representatives from dozens of veterans service organizations that serve multiple generations of wounded, ill, and injured service members and their families, as well as members of the government, including Secretary of Veterans Affairs Robert Wilkie. Across America, WWP participated in numerous Veterans Day ceremonies including the New York City Veterans Day Parade where hundreds of WWP veterans, their families, volunteers, supporters, and teammates marched up Fifth Avenue in honor of all who have served. Since 2003, WWP has been a loyal advocate for our nation’s finest, improving the lives of millions of warriors and their families. WWP is committed to helping injured veterans achieve their highest ambition. When they’re ready to start their next mission, WWP stands ready to serve. To learn more, contact our government and community relations team via Mattison Brooks or visit https://www.woundedwarriorproject.org/programs/community-partners.